Genealogical DNA tests often provide a profile that shows a person’s ethnic background. Interestingly, many users are surprised to learn that their genetic heritage is different from that of their siblings. How can full-siblings have different ethnicities when they have the same parents? While this might seem strange or even impossible, it’s actually pretty common. It’s a consequence of the complex relationship between genetics, ancestry, and ethnicity. Even though siblings share the same ancestors and cultural background, they can still end up with different genetic backgrounds. This article will dive into the science of how DNA is passed down from parents to children. But first, let’s consider a real-world scenario that illustrates how two siblings can end up with different ethnicity estimates from their DNA test results. 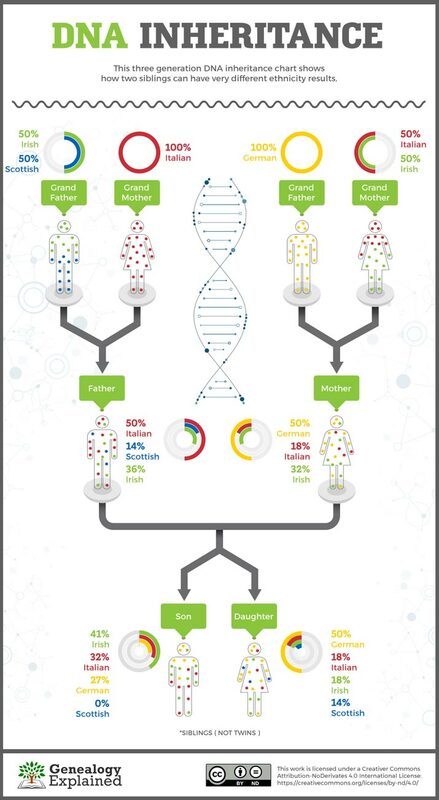 For our complete guide to DNA testing, click here. Each person has 22 dots which represent the first 22 pairs of chromosomes (the autosomes). (X and Y chromosomes are excluded in this example.) Parents each pass half of their dots to their children. The result of this simple three generation DNA inheritance example is that the two siblings have very different ethnic backgrounds – according to their DNA. But by looking at the genetic profiles for each family member, we can see how the genes were passed down over two generations and where they likely came from. It might seem natural to assume that the chromosomes each child receives are representative of their parents’ chromosomes. For example, most people think that if one of their parents is 100% Irish, that they must be at least 50% Irish. In the example illustrated above, the mother is only 50% German, so the daughter (also 50% German) might assume that her father is part German, too. Similarly, she might also suspect that her mother is part Scottish since both she and her father are 14% Scottish. But considering the ethnicities of the different family members, there are more likely scenarios that explain how the genes were passed down. The daughter’s DNA is 50% German, but the son is only 27%. Also, the daughter is 14% Scottish, just like their father, but the son has no Scottish DNA. One possible explanation is that the different Scottish genes crossed over onto one chromosome that the daughter received, but the son didn’t. It’s also possible that the son happened to get more genes from his Italian grandmother, instead. The son has more Irish genes as well. Taken together, this suggests that the son received more DNA from their grandmothers and the daughter received more from their grandfathers. There’s another interesting consequence, too. Many genealogical DNA tests compare samples of their users to find possible relatives – a gold mine for genealogical research and breaking down brick walls. In this scenario, the daughter will have shared segments of DNA with Scottish relatives who won’t match with her brother. Her brother might then incorrectly assume that he’s not really related to those Scottish cousins. Even though they have the same ancestors in common, they just don’t share those specific segments of DNA. Note that this usually will not happen with close cousins (first-third) due to the amount of total shared DNA. So while an ethnicity report can tell where an individual’s genes originated, the results between close family members (such as siblings) will not always be the same. It’s simply the unpredictable nature of genetic inheritance which is what makes every person unique. Let’s talk about another analogy to drive home this point by using a deck of playing cards. 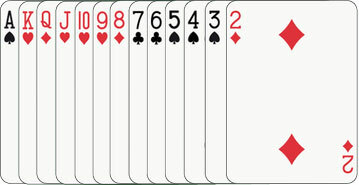 The value of each card represents a chromosome and each suit represents the SNPs (single-nucleotide polymorphisms) of a particular ethnic group (e.g., Irish, Italian, German, Scottish). 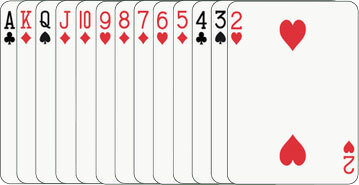 Organize the cards by number and randomly deal a hand with one card of each number. Then, reshuffle the cards and repeat this a few times. 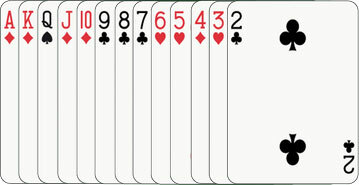 As you can see, each hand is completely different, even though they were all drawn from the same deck. Each hand has a completely different suit profile, as well. 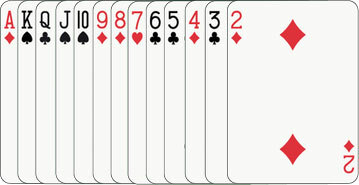 None of the hands ended up with the same percentages as the original deck (25% of each suit). Similarly, the genomes of two siblings are drawn from the same genetic deck, but they will likely draw different cards. This means the amount of DNA they have in common will also vary. On average, siblings usually share roughly 50% of their DNA with each other, but it depends on how their chromosomes randomly assorted. Let’s now clarify how genealogical DNA tests are able to quantify someone’s genetic ancestry. In other words, what exactly does it mean to say someone has “Irish” or “Nigerian” or “East Asian” genes? While every person’s DNA is unique (except identical twins), the vast majority of the human genome (over 99%) is identical in everyone. As humans have evolved, random mutations have accumulated in our DNA, causing more variation between our genomes. The most common mutations are called single-nucleotide polymorphisms or SNPs (pronounced “snips”). This means that one base of DNA has been changed at a particular location in the genome. For example, a sequence of DNA that ordinarily reads “…AAGTCACGTA…” might get changed to “…AAGTGACGTA…” instead. If those mutations happen in sperm or egg cells, the altered sequence can get passed to a person’s children, grandchildren, and future generations. Geneticists have classified millions of distinct SNPs in various locations in the genome. When a group of people becomes isolated (geographically or culturally), new types of SNPs will appear in the population. By analyzing the genomes of many people in different groups, researchers can identify the characteristic SNPs of that group. Genealogical DNA tests analyze the SNPs in a person’s genome and compare it to the genetic sample profiles associated with different ethnic groups. Using this information, they can determine someone’s ethnic background and where their ancestors are from. Each testing company uses their own proprietary algorithms to calculate this, so that’s why your ethnicity results from AncestryDNA may look different from your 23andMe results. For example, see our article on 23andMe vs AncestryDNA here. This all stems from how the genome is organized, divided, and recombined to make a unique genome. The human genome is divided up into long segments called chromosomes. There are 23 different pairs of chromosomes: Each genome has 22 pairs of autosomes (numbered 1-22) and either two ‘X’ chromosomes (in females), or one ‘X’ and one ‘Y’ chromosome (in males) which is the 23rd chromosome. Under normal circumstances, everyone has two copies of each chromosome – one copy comes from their mother and one from their father. Egg and sperm cells (also known as gametes) are formed in a process called meiosis. Meiosis begins when the entire genome is duplicated in specialized precursor cells (called oocytes and spermatocytes), and DNA is condensed into chromosomes. Homologous chromosomes (different copies of the same chromosome) get paired together and neatly organized into a line inside the cell. 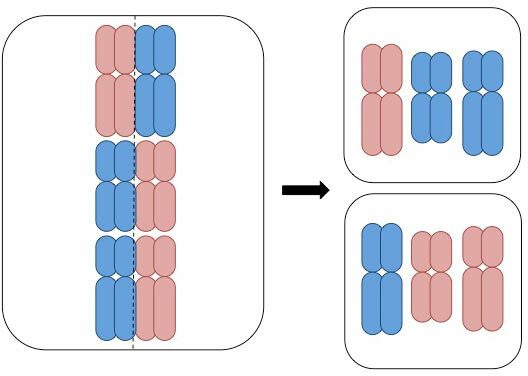 When the cell starts to divide, the chromosome pairs are pulled apart and evenly split between the new cells. These two cells then divide again, resulting in four cells, each with one copy of each chromosome. When the chromosomes are divvied up, they are sorted randomly into a cell. Each cell gets a copy of each chromosome from either the mother or the father, which will eventually be passed on to their children. Because there are 23 chromosomes, there are over eight million (2^23) possible combinations. This cell has been simplified to show 3 types of chromosomes instead of the 23 found in the human genome. After the second round of cell division, there are four gametes are produced, and each has one copy of each chromosome. But notice what’s happened to the ancestry! 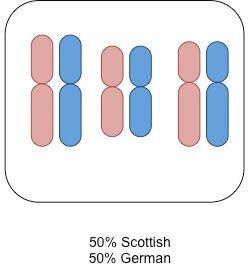 Half of the gametes have 33% Scottish, 66% German genes and the other half get 66% Scottish genes and 33% German. 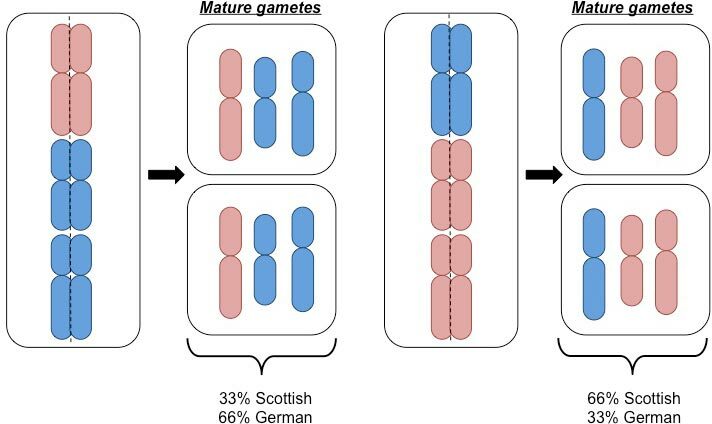 If the child gets the gamete on the left, the Scottish ancestor will contribute twice as much DNA to the genome than the one on the right. Even though the person had 50% Scottish and 50% German genes, they passed on a different ethnic profile than their own. That’s because the chromosomes arranged themselves into cells independently of each other. Because there are really 23 chromosomes, it is unlikely to be that heavily skewed, but the two ancestors will not contribute the exact same amount to each gamete. There’s another important source of variation that occurs because of a process called chromosomal crossover. At the beginning of meiosis, after the genes were duplicated and lined up, the homologous chromosomes are briefly attached to each other. The amount of crossing over that occurs is random, but It’s thought to occur in every gamete. Sometimes it’s small pieces of DNA, other times its large fractions of the chromosome. Because the maternal and paternal chromosomes can now exchange genes, countless new combinations are possible. After crossing-over, the gametes have even more varying genetic ethnicities as before. That’s how families can wind up passing on ethnic profiles in unexpected ways. I hope this article was helpful for understanding how and why siblings might have completely different genetic ethnicities even though they share the same ancestors and cultural backgrounds. For more information on DNA testing and how to choose the best test for your genealogy goals, read our guide here. The 1000 Genomes Project Consortium. An integrated map of genetic variation from 1,092 human genomes. Nature 491 (7422), 56-65. Nov. 1, 2012. Vignal A, Milan D, SanCristobal M, Eggen A. A review on SNP and other types of molecular markers and their use in animal genetics. Genetics Selection Evolution 34 (275). Feb 11, 2002. Jones GH, Franklin FCH. 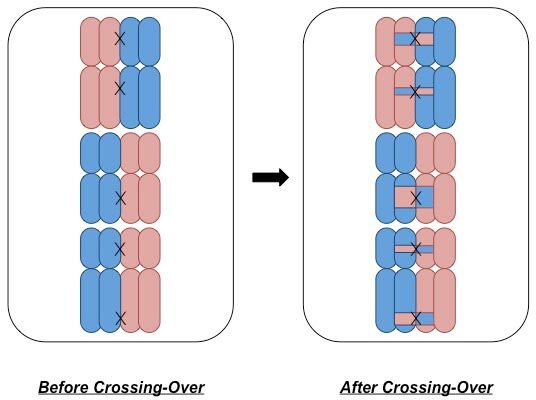 Meiotic Crossing-over: Obligation and Interference. Cell 126. July 28, 2006. 246-248. Griffiths AJF, Wessler SR, Lewontin RC, Gelbart WM, Suzuki DT, Miller JH. An Introduction to Genetic Analysis, Eighth Edition. New York: W.H. Freeman and Company, 2005. 96-103.